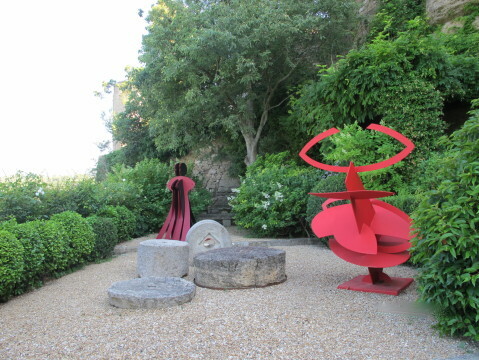 It’s a balmy Saturday evening in Provence, July 20: at 6:00 p.m. outside the green iron gates of the Château de l’Ange in the hameau of Lumières where fashionable people are queuing up dutifully to receive – from young women in little black dresses – their pre-assigned section in the garden behind the large proud chateau of Édith Mézard, designer of elegant and beautiful linens for the home – bath, beds, sofas, tables – and les petits cadeaux. 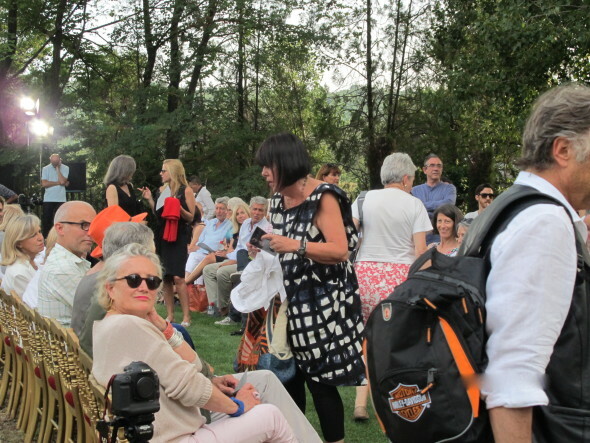 A printed invitation announced a presentation of “technobohemian,” a menswear fashion line created by John Malkovich (JM), the esteemed American cinema and theatre actor and director, a longtime occasional denizen of nearby Bonnieux. A flush of excitement grips the air. The guests know nothing about the program; they hold only the promise of a glittery time in the presence of the celebrity of the moment and other luminaries: the distinguished Pierre Cardin in track shoes, the vrai chic lingerie designer Chantal Thomass, the all too handsome French actor Lambert Wilson, and the muse and lover of Dali, Amanda Lear, who has the voice of a Marine. A large panel at the entrance announces en anglais the philosophy underpinning “technobohemian,” a brand JM launched in 2009, which replaced a discontinued fashion venture “Uncle Kimono.” We read that the garments are all made in Italy with the exception of denim from Japan, and that he creates all the designs and chooses all the fabrics. All in our places behind the Château, music flares up, cuing a brief stylized parade on the garden grass runway of twenty-some bare-footed guys draped with casual fashions: smart and loose-fitting ensembles with some funky mix and matches, styles destined for the thin waisted metrosexual with a dandyish bent, who suffers no impoverishments in life; whose ample net worth permits the folly of buying a piece here or there with no fuss of leaving it unworn in the closet for a year. As soon as the defilé makes a final entrance en masse, JM comes out from the Chateau attired in a baggy baby blanket two-button blue suit cut from gauzy-like fabric – the trousers flopping around his legs like over-sized pyjamas. Pause and consider the baby blanket blue suit as a touchstone of JM’s stuff: it typifies what David Foster Wallace identified as “terminal idiosyncrasy”: where a designer’s concepts and creations come off as just too particular to him alone and his tastes for dressing himself. There you have it: richly-textured fabrics fashioned into objects of self-love, a vainglory compelling the investment of the most extraordinary effort and emotion into the craft of haberdashery. JM, his head bobbing as he takes long strides down a grassy aisle, his hands making a sheepish split finger wave, then a low bow, a pivot, and shoulder-dipping strides and fluttering hands as he vanishes back inside. Lacking the continental air of mastery of proven courtier talent, JM appears seemingly ill-at-ease playing a role that he may not rehearse nor relish. 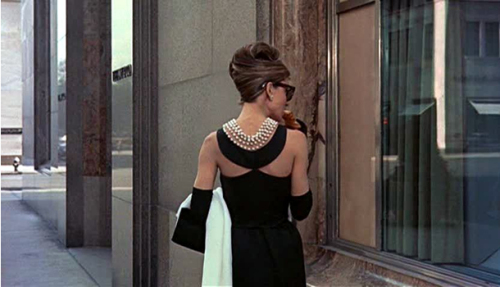 The 75-second performance evoked the first inkling of whispered discordance – remarks that the tonsured actor might have grabbed a mike and uttered a few sentimental words of appreciation to the guests, who are after all not snarky fashion journalists nor difficult retail buyers; they are his neighbors in a land he professes to love. Nor does JM elect to make an appearance at the cocktail afterwards where he could engage charmingly and warmly with le peuple in a sort of Luberon all-togetherness, preferring to escape back into a privileged envelope of celeb privacy. There would be no “up close and personal” this evening. Few audiences in the Luberon have been as aggressively and carefully recruited for a summer happening than for tonight’s agenda. 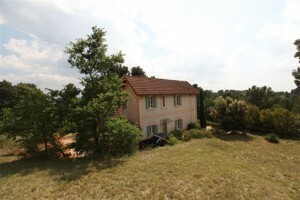 But: meubler le jardin. Now if you keep in mind the kind of media manipulation we experience at the hands of celebrity publicity machines, you quickly recognize that the mis-en-scene this evening strives to provide a narrative and images for media consumption – TV and print. A coup de marketing. A PR exercise. Here’s the thing about obligatory payback at modish and voguist events: the standard default gesture is to pamper the participants afterwards with an admixture of riveting badinage and good food with a bit of drink. As the first group of guests wandered into the cocktail on the front lawn, they were greeted with small stacks of white boxes of thin-sliced pizza, sitting on two tables. Some flinched at the sight of food not placed on trays and the absence of plates and napkins. The scene was not all that dissimilar to the experience of a frat house game watch party or your teenage daughter’s sleepover. As hungry fingers lifted the slices from the boxes, the pizza was consumed in a transitory moment, leaving later-arriving guests in a state of gustatory nothingness – not even nuts, crackers, chips or other banal over-salted supermarket finger food. A modest quaffable wine was served from a local winery owned by JM lui-meme. At a certain moment, an inadequate number of glassware left no clean wine vessels to drink out of, and a bit later white wine was unavailable due to insufficient stock. What mild irony came calling for cocktail attendees Pascal Lainé, whose gallery splash the night before feted guests with tray upon tray of scrumptious amuse-gueules, and Christine-Ruiz Picasso, the great patron of the arts from far-off Viens, where earlier this season at the Chapelle Saint-Ferréol invitees reveled in a lush buffet of cavier and foie gras. Consider this impudent incongruity: in the boutique off of the cocktail lawn hung pieces from the show, some ensembles going for as much as 800 to more than a 1000 euros – a single purchase could feed with pizza the entire student body of Reed College. Twice. 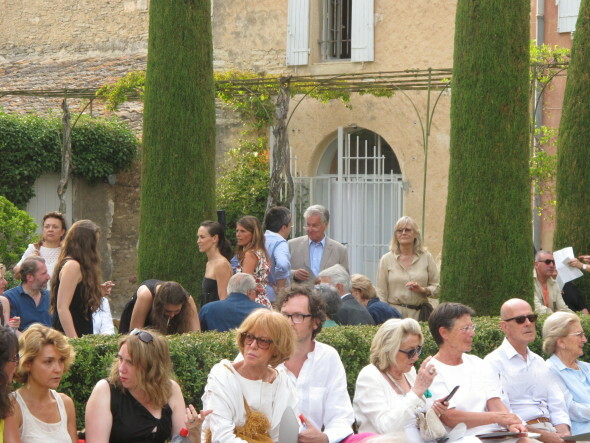 It gashes the memory to recall an event in the Luberon when such a fashionable and celebrity-flecked crowd did not merit a tasteful first-rate caterer (un traiteur). Try to pull off an evening like this one in Montecito or East Hampton, and people would be seething with discontent, tossing their wine glasses defiantly into the shrubbery. So it turns into the last place that you want to be on a glorious evening in high season in Provence, but you just can’t rip yourself away; your retinue is making the rounds catching up with those that need catching up with, so you wander about and participate in languid muddled conversations, and then you are wickedly fortunate to recognize a long-lost visage, one you haven’t seen for a few years: a rejuvenated Harry Holcroft, the once Lacoste-based artist who shuffled off to India, and presently is back for ten days to prepare his spatial property for punters from America, and is then up to London for an exhibit in late September before heading back to northern India. Encountering the high toned Harry was a bracing tonic of acrid humour at an otherwise flawed drinks party. As we joined a serpent line of cars filing out into a warm limpid night, an intense desire asserted itself to search out something totally authentically provençal: an aoli. 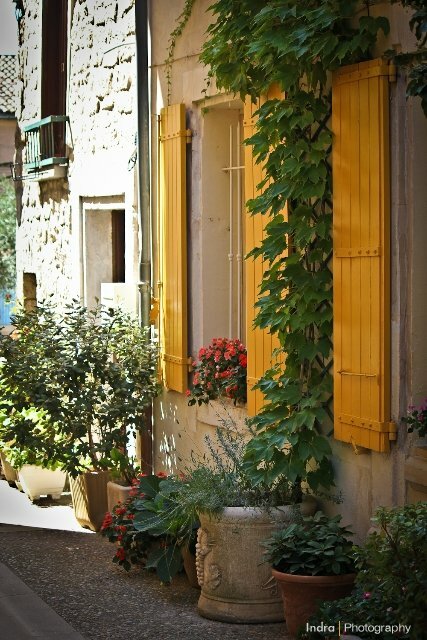 Volets: count the colors splashed on shutters that animate the landscape of Provence. Patches of bright spots abound. 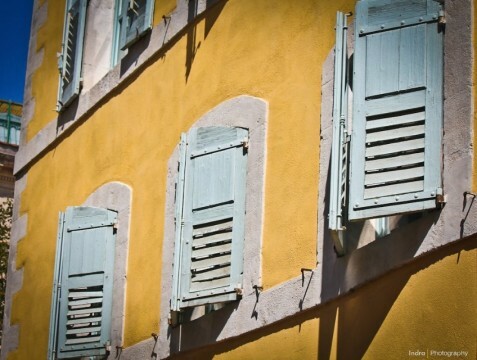 Some villages or neighborhoods color-coordinate their shutters, And some shutters age naturally, taking on a faded worn patina. Popping into E.LeClerc in Avignon, PVB asked the sales clerk what are the top selling paints for shutters. The category leaders are a Provence Bleue, and a Gray-Green called Vert Provence. 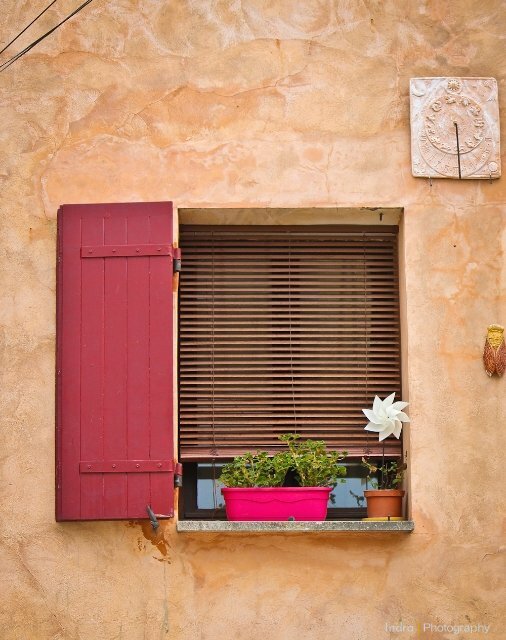 In Provence, shutters function as protection against the wind, the Mistral that roars down from the north, and as temperature control. In the hot summer days, windows are opened and the shutters are closed, blocking out the sun while allowing air to circulate in the room. 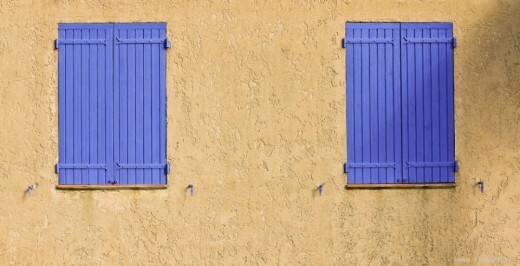 In the winter, shutters hold out the rain and the cold. 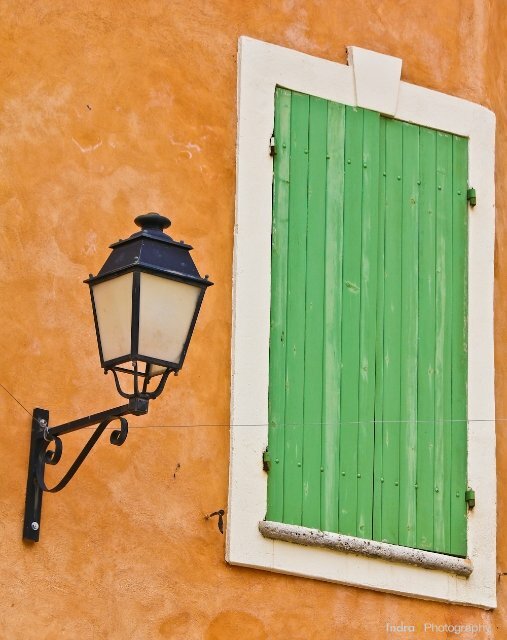 The sturdy wooden shutters (see the Youtube link below) have a metal handle that rotates a rod, called a cremone, which locks shutters in place. 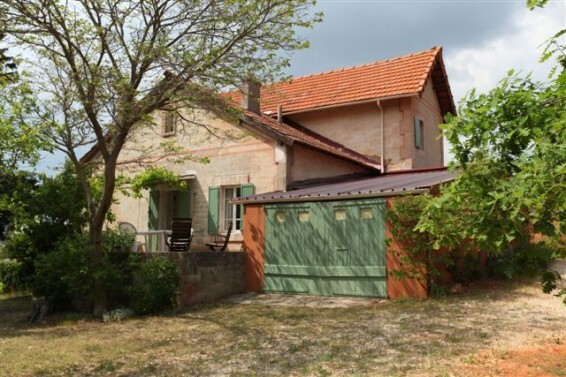 When opened fully, the shutters are held against the wall by an arret, usually a metal holder attached to the wall that is moved over the shutter. (In the photos above and below, the arrets are visible). 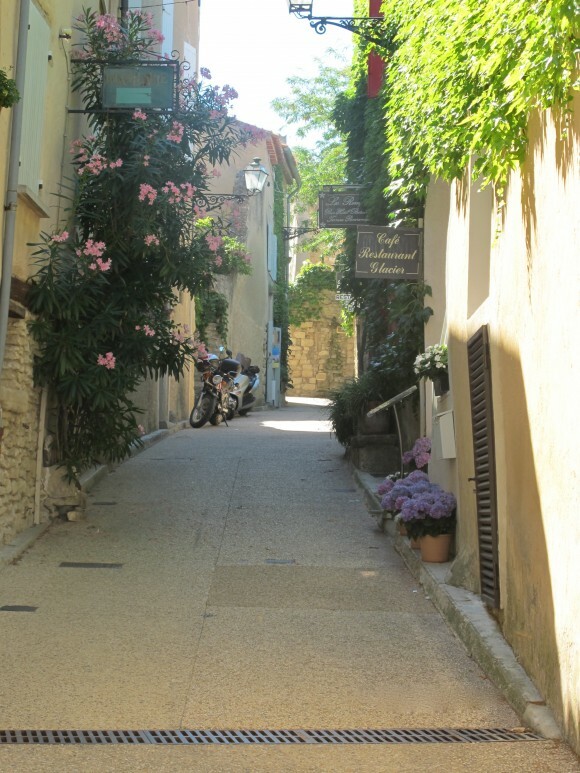 The photographs displayed here were taken by Indra Van Regemorter, who resides in Amersfoort, the Netherlands, during her sojourn last summer to Provence. Assigning herself as an autodidact, Indra composes her own work except with rare assistance from food stylists. Born in Antwerp, Belgium and raised partially in Dallas-Ft.Worth, Texas, she resides in Amersfoort, the Netherlands. Henry James wrote this tribute to John Ruskin, the author of Stones of Venice. 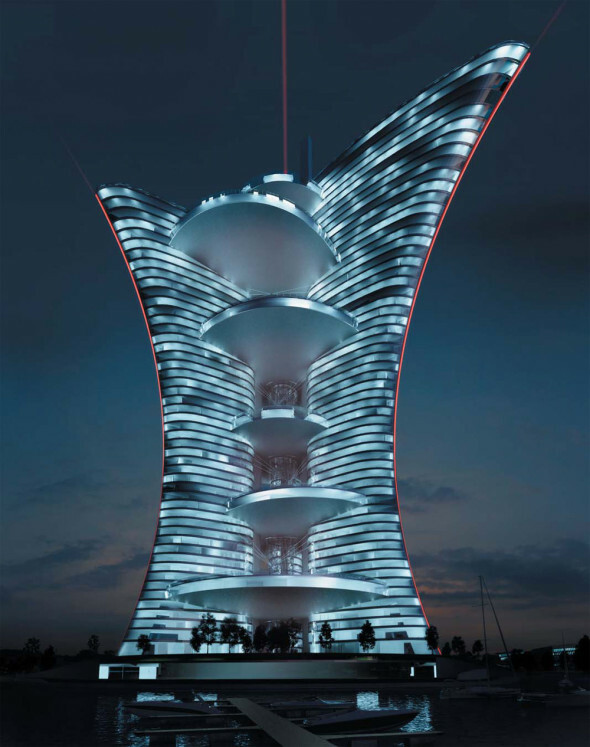 The passage is also an apt expression of the desire of Pierre Cardin for whom Venice, his birthplace, is an “object of passion” and whose proposed Light Palace was a gift to Venice and the world. 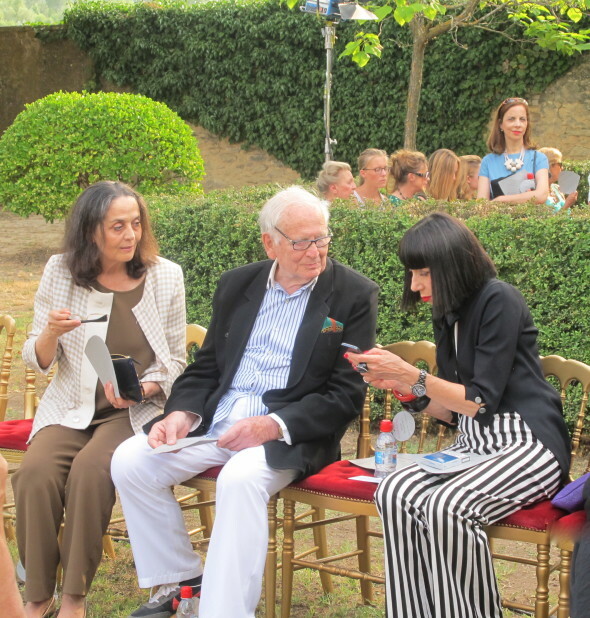 On Thursday, 27 June 2013, the CEO of Concept Creatif Pierre Cardin, Rodrigo Basilicati, the nephew of Pierre Cardin, announced that the Light Palace project in Venice has been terminated. 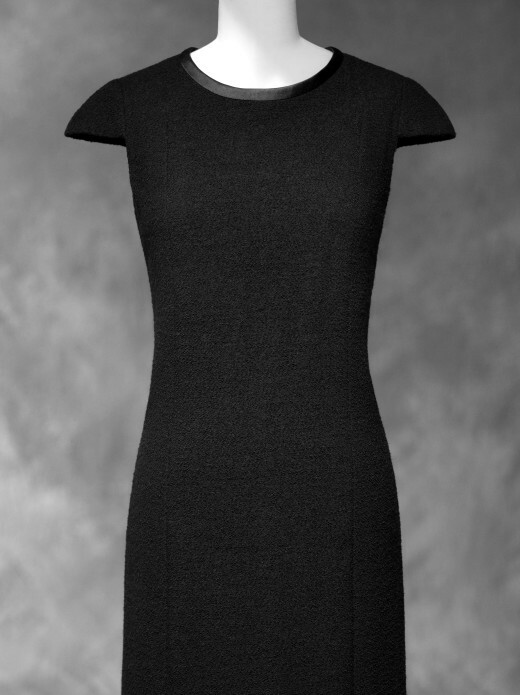 Concept Creatif Pierre Cardin is the management company of the project. For details, please read the diligent coverage of Venice development mazen Dominic Standish, a denizen of Venice, here. PVB’s perspective posted last September is here. 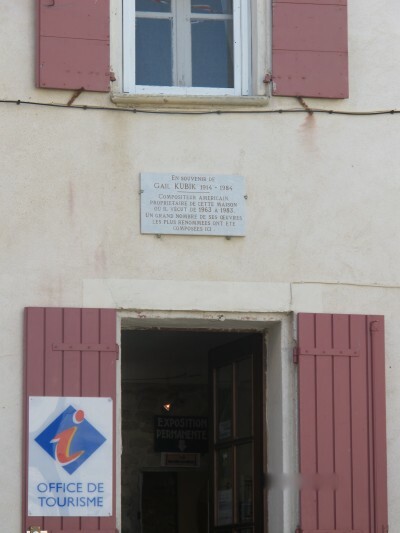 In Lacoste where he is preparing for the 13th edition of the Lacoste festival, Mr Cardin is rumored to be bidding on more houses along the rue Basse, deals that are cutable – as they say in Hollywood – as opposed to the Light Palace in Venice or a golf course in neighboring Bonnieux. Keep it cool! 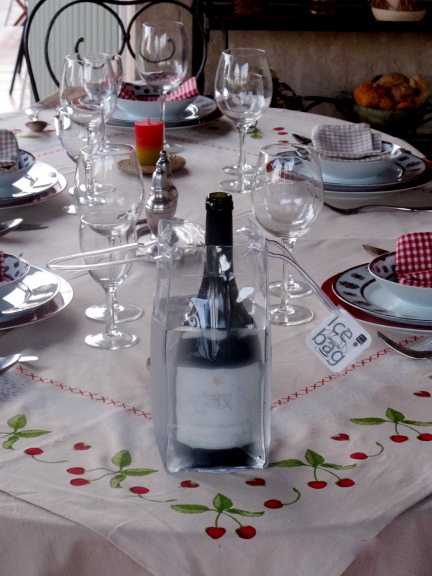 The Ice Bag is a red wine lover’s accoutrement du jour in the Southern Rhone. A summertime mis-en-scene: your waiter uncorks a bottle of red wine from a quality winery, one you ordered with conviction as a wine guru validated it with a score of 90-plus, and at first sip the wine is ‘en bouche’ warm. 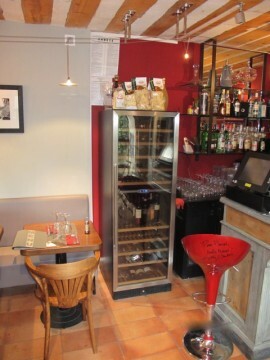 In a majority of restaurants and cafés in the Southern Rhone – small to mid-size businesses with no sommelier (even some Michelin star restaurants have no sommelier) — the daily stock of wine is brought up from the cellar and it sits in a warm bar or dining room area for hours. Few places are air-conditioned. The wine, brought to room temperature (chambré), is toasty by evening. 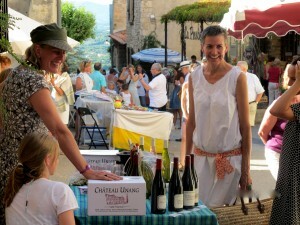 Southern Rhone reds are often served warm in restaurants, cafés and at the gite or home table. When warm, red wine quickly looses it freshness, the alcohol is perceived as out of balance, and if left too long in heated conditions it develops ‘bottle bouquet’ that spikes its nose (smell) and flavor. The ideal serving temperature for a Southern Rhone red is 15-17°C / 59-63°F, and that applies to the duration of the repast. 1 – At a gite or a house cool the red wine in a refrigerator before serving, and use an ice bag with cool water to maintain the proper temperature at the table. 2.- At a restaurant, inquire about the temperature of the wine before ordering. If the establishment serves the wine warm and does not have ice bags, inquire if they can cool the bottle(s) that you are ordering. Do not be timid: Keep in mind that restaurants depend upon the handsome margins from wines to realize a profit. There is no reason to be reticent. In fact, the more demanding that you are the more respect you will merit from the waiter or sommelier. 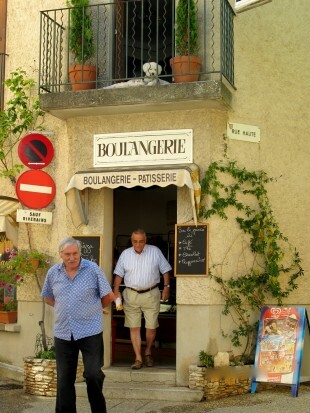 In Gordes, there are two restaurants that employ these solutions. 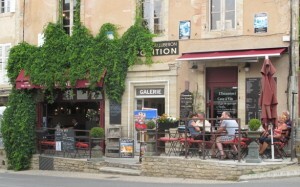 The wine bar and restaurant L’Estaminet on the main square of Gordes places its red wines in ice bags, which are also for sale to customers. The Casa Rosario, which serves pasta and salads, keeps its excellent wines in a cave de service. 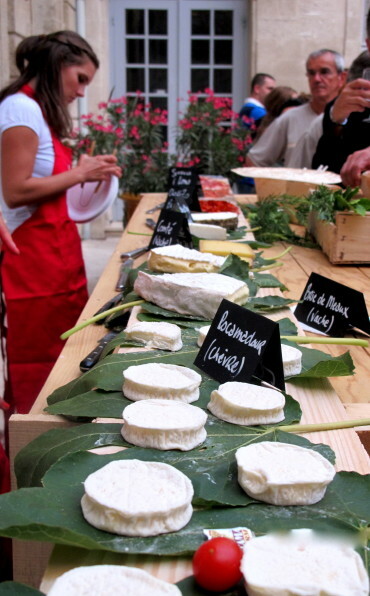 The Southern Rhone’s biggest nightly pour in July: for four hours nearly every evening this month you can satiate your palate with a variety of quality Côtes du Rhône wines while quieting your appetite with some eerily delicious charcuterie and cheeses, all for 5€. You feel pampered, as if someone is giving you a gift. 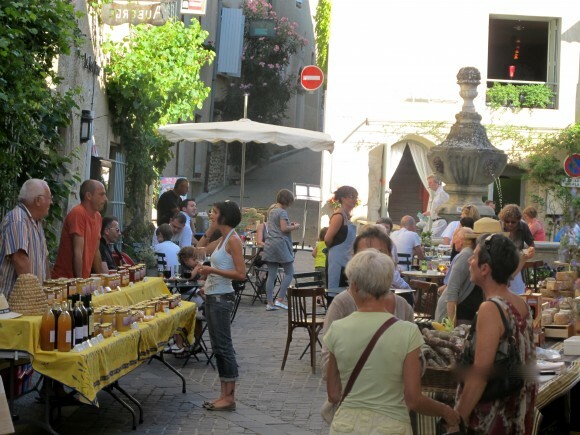 It all comes down within the high ancient walls of a courtyard, insulated from the cramped Avignon Festival streets, of the Maisons des Vins where 200 to 300 wine lovers partake in a happy ritual. 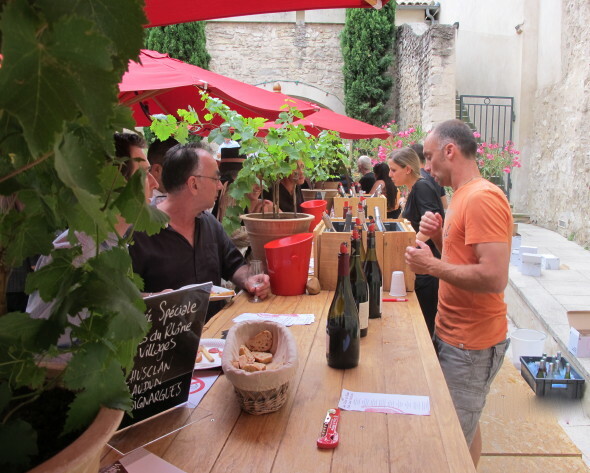 Know that each evening the Côtes du Rhône tasting renews itself by a new selection of wines from other areas and other wineries within the appellation. 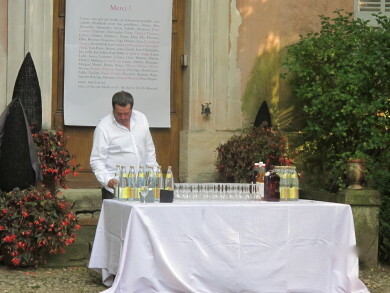 You may find this sort of radical generosity unusual for a wine tasting. You recall other tasting experiences where the server was niggardly in filling up your glass with no more an inch of wine, where someone was pushing an order form under your nose, or asking you for your email address, or where the wine did not merit anything more than a first sip. 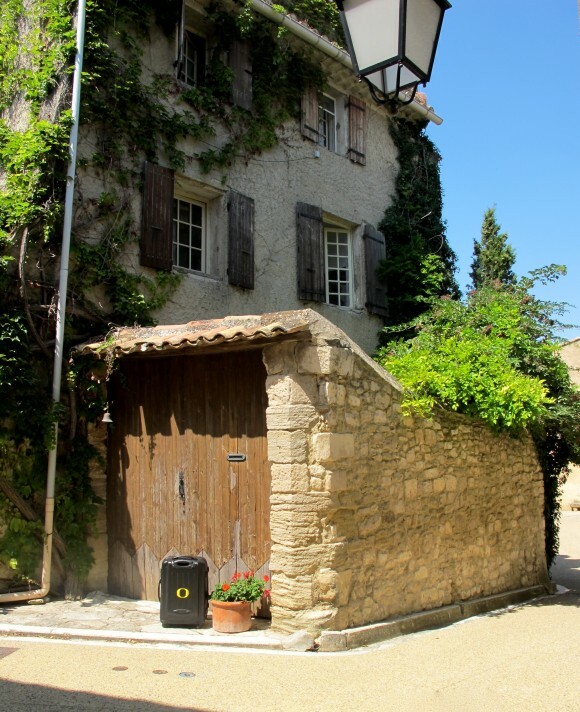 So what a feeling of pure pleasure when, at the Maison des Vins, you quickly intuit that your host – Inter Rhone – is acting out of affection and love for the wine. The July tasting schedule is listed on the website. Opening night is July 5; closing night is July 26. 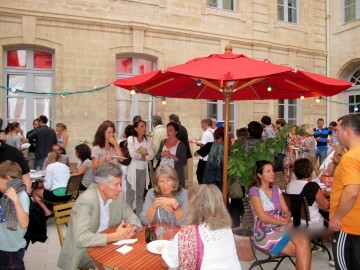 The tasting on Friday, July 12, features the official cuvées of the Avignon Festival from Vacqueryas, and on Tuesday, July 23, the Women Winemakers of the Côtes du Rhône are offering their wines. There are no tastings on July 14, 18 and 22. Open from 7:00 p.m. to 11:00 p.m. Entry free, For 5€, a logo wine glass for tastings, a shopping bag and an “ethylotest” to measure if one is safe for the road. 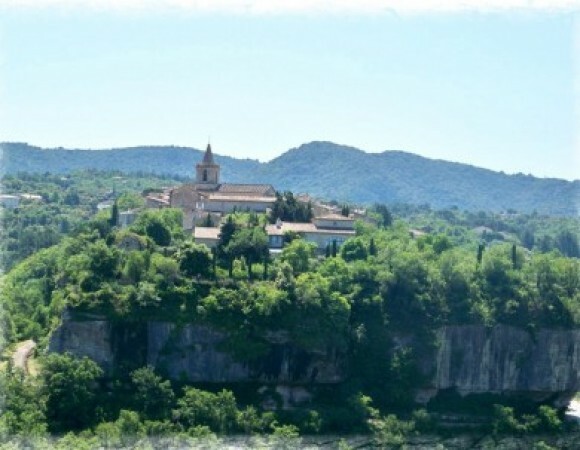 In 1990, Allen and Marie-Laure Chevalier sold their home in Versailles and moved to Lourmarin where they purchased a 16th-century estate and vineyard, the Château Constantin, a gorgeous site of rolling hills and verdant vistas covering more than 100 acres of vines, olive groves and oak forests. On the western border of the vineyard, the L’Aigue Brun river deposited on its edges a thick carpet of round stones similar to those found in the Châteauneuf-du-Pape. Embarking on a complete makeover of the vineyard and installing modern equipment, M. Chevalier introduced his first vintage of a rebranded Château Constantin-Chevalier vinified from the 1991 harvest. With fierce passion and joy manifest, Allen Chavalier came to produce through twenty years some of the richest vintages in the AOC Luberon until his passing in August, 2011. By 1996 the celebrity-drenched (2 books) Peter Mayle had fled his Ménerbes home in the Luberon for the chic environs of the Hamptons. 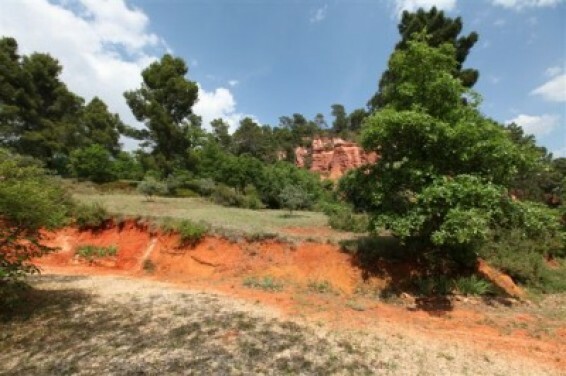 Upon his return to the region in 2000, he took up residence along with his wife and their dogs in an 18th-century bastide – a 14-acre estate – on the edge of Lourmarin (now sold). 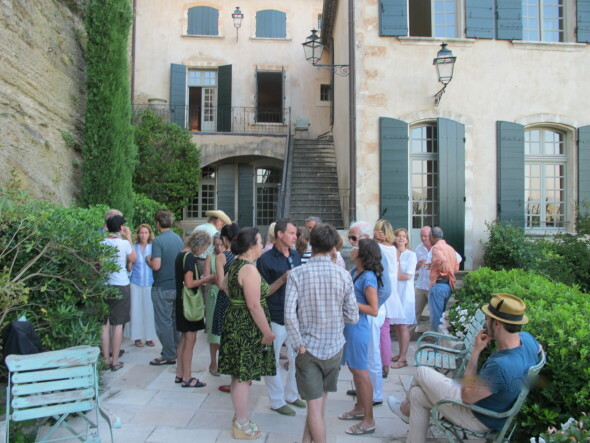 The Château Constantin-Chevalier borders the upscale sleepover Les Olivettes, run by Joseph and Elizabeth DeLiso, an American and a Brit respectively, who are among Mayles’ retinue of friends in the Luberon and huge fans of the Château’s wines. Within your wine mind, there are moments when the first taste of a vintage is riveted in imperishable memory. 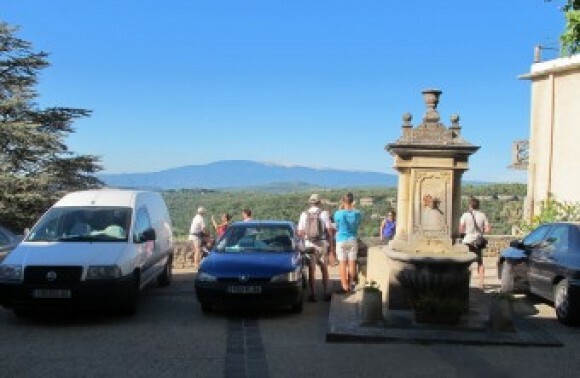 One of those flashes of terrible precision arrived in August, 2008, when PVB escorted some posh friends from London to Lourmarin. 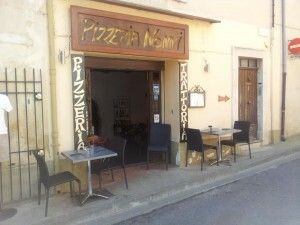 As evening approached and with kids to feed, we took a sidewalk table at the Pizza Nonni. A local wine was in order; a red was selected. At first sip came the bracing sensation of enriched pleasure which reawakened some childlike part of your brain. And so began an indissoluble relationship with the wines of Château Constantin-Chevalier. Peter Mayle must have arrived at a similar moment of terrible precision, for he has often cited the Château Constantin-Chevalier among his favored wineries and the Château’s rosé as his preferred tipple, and, alas, his long friendship with Allen underpinned by a love of wine. 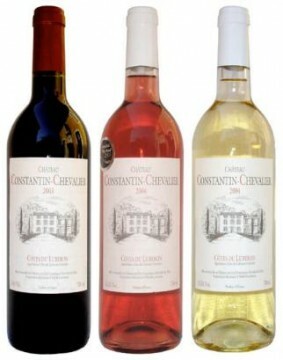 The Château Constantin-Chevalier produces three red vintages, two white and two rosés. Grape varieties are Grenache, Syrah, Carignan and Mourvèdre for the Reds; Ugni-Blanc, Roussanne, Clairette, Vermentino for the Whites. The Cuvée des Fondateurs, aged in oak barrels for a year, is an exceptional red – rich texture and deep flavors. The ‘bleed’ Rosé, known as rosé d’une nuit, is an aromatic and perky drink; likewise the paler Rosé Pétale de Rose. AOC Luberon: 40% Syrah, 40% Grenache and 20% Carignan. AOC Luberon Cuvée des Fundateurs: 40% Syrah, 40% Grenache and 20% Carignan. AOC Luberon Rosé d’une Nuit: 50% Grenache and 50% Syrah. Saignée. AOC Luberon Rosé Pétale de Rose: 50% Grenache and 50% Syrah. Saignée. AOC Luberon Blanc: 65% Vermentino, 15% Clairette and 20% Ugni Blanc. AOC Luberon Blanc Cuvée des Fundateurs: 60% Vermentino, 15% Clairette, 15% Ugni Blanc and 10% Roussanne. 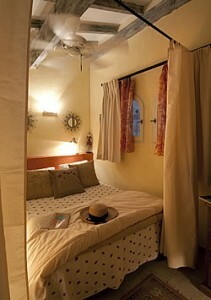 Les Olivettes: One might call it a B&B squared, more than a bed and more than a breakfast. 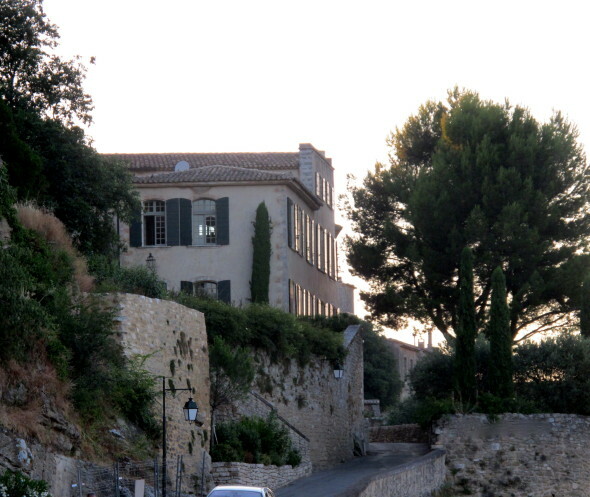 The uniqueness of Les Olivettes, a luxuriously renovated Bastide on the fringe of Lourmarin, is that its six spacious apartments all have fully-equipped kitchens, freeing guests from the daily captivity of restaurants, although in Lourmarin, a culinary hotspot, the temptations for fine dining abound. 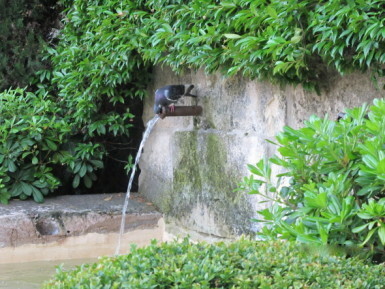 A Provencal breakfast and other repasts are taken in your room or on your terrace per your leisurely schedule. 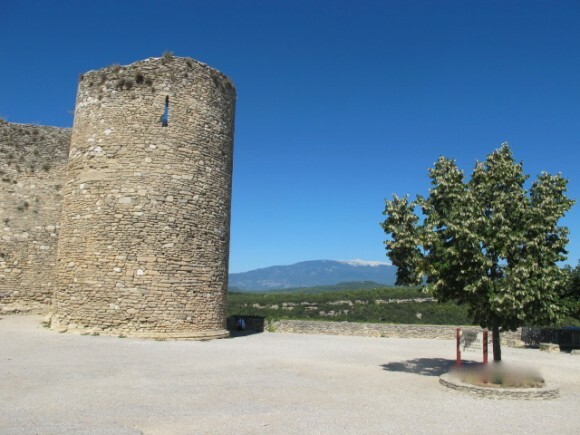 Avenue Henri Bosco, 84160 Lourmarin, Email: lourmarin@olivettes.com, Website The property is south of the village; the road is also marked D27 in the direction of Lauris. 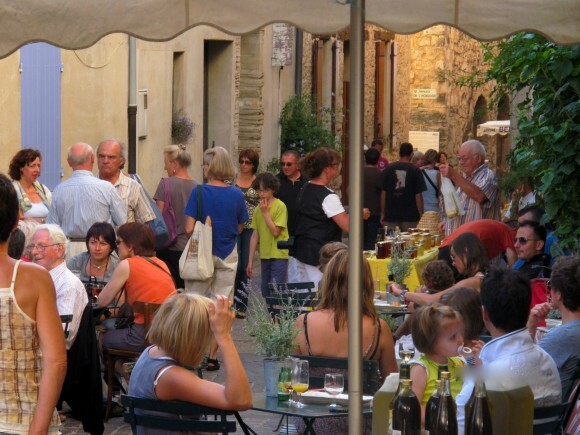 Pizzeria Nonni: serves tasty provencal-style pizza and other Italian fare in a cozy and warm interior on cools days or on warm summer evenings at quiet sidewalk tables nestled around the Fontaine la Cordière. 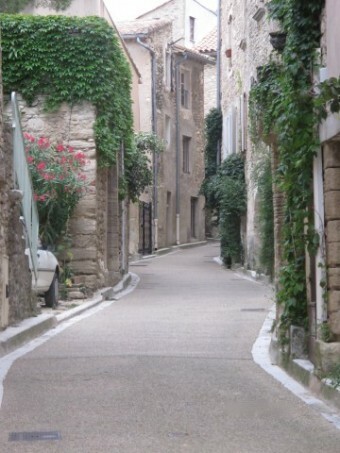 A short walk up the slope of rue Henri de Savornin from the center of the village. Reservations for outdoor dining a must. Closed Mondays.